Product #31509 | SKU KIT-D22-230 | 0.0 (no ratings yet) Thanks for your rating! 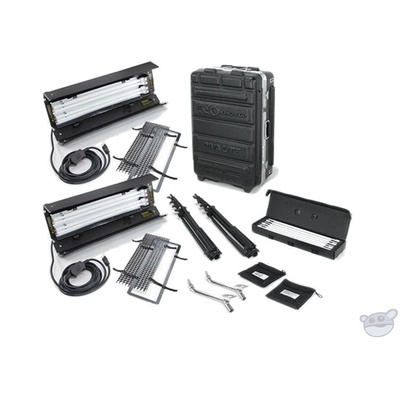 The 230VAC Dual Diva-Lite 201 Fixtures with Flight Case Kit from Kino Flo consists of two Diva-Lite 201 fixtures, light stands, offset mounts and diffusers. In addition to all of the gear included in the kit are two cases, one Lamp Case for your fluorescent lamps (sold separately) and a Heavy Duty Travel Case to safely pack and store the fixtures and equipment when travelling and shooting on-location. The Kino Flo Diva-Lite 201 is especially designed to provide broad, smooth lighting with a built-in dimming ballast, barndoors and centre mount. Remote dimming is also an option with the DIM-5 Remote Dimmer (sold separately), and either method dims the lights from 100% output down to 5.0%. For more light control options, the included Flozier and Honeycomb Louvre allow you to soften or spread the light out in various ways. The Flozier slips over the front of the fixture, providing a large area of white diffusion. While the Honeycomb Louvre spreads the light with a minimal amount of light loss at the beam's centre. These do not slip on, but are held to the fixture by touch-fastener. To mount your lights simply attach the included light stands to the Centre Mount, with its ball and socket design and lock down handle. At the end of the Centre Mount is a Baby Receiver that can go directly onto the light stand, and provides access to the included Offset Mounts. These can be used to centre the weight and balance of the fixture over the centre of the stand. This is recommended when using lightweight kit stands to increase stability, or to under-hang the fixture. Even in the hands of an inexperienced lighting professional, the subject will likely end up very well-lit with the Diva-Lite 201's soft, diffuse lighting. When combined with all of the other accessories and equipment in this kit you'll have nearly everything you could need when setting up quick and efficient on-location lighting whether at home or abroad. The Diva-Lite 201 light fixtures provide a broad, soft light source great for photo or video work. Their compact size and rugged build make them well suited for travel, especially when paired with this kit's Heavy Duty Travel Case. With two included Diva-Lite 201 fixtures, each supporting two 21" 55W compact fluorescent lamps, you'll have a total of four Kino Flo True Match 55W compact fluorescent lamps, which can optionally be swapped out with Daylight balanced and tungsten balanced lamps (sold separately). The Diva-Lite 201 features a built-in dimmer control that can decrease the amount of light from 100% down to 5.0%. It is not recommended that the dimmer be used to adjust exposure levels, however, because as the lamp cools the colour may drift into the magenta spectrum. The optional Remote Dimmer DIM-5 (sold separately) provides tethered access to the light's output when you can't reach the onboard dimmer knob. The Diva-Lite is an efficient soft light, which is especially important when shooting on-location and power availability is an issue. All fluorescent lamps require some "burn in" time before they operate at their rated Kelvin temperature and brightness. For dimming products, the lamps perform best after 100 hours of operation. Due to portable nature of the Diva-Lites, the lamps can be damaged from handling and transport before "burning-out" so the included Lamp Case included in this kit will help them last. With its proprietary chemistry, the True Match lamps in a Kino Flo fixture display a unique quality of soft light. The smooth beam gradient responds especially well to the new generation of HD cameras on the set and works side by side with traditional tungsten sources without corrective filtration. The Diva-Lite is most effective in close proximity to the subject because it puts out a broad soft wash of light, like the light off of a bounce card. By being close, the light is easier to control with the built-in barndoors and detachable louvres. The built-in Centre Mount has a ball and socket design with a lock down handle that, when released allows you to reposition the fixture and lock it back down in place. At the other end of the Centre Mount is a baby receiver (16mm) that can go directly onto a light stand, adding versatility to the way you mount your lights. Whether you need to get technical or creative, the included accessories in this kit allow you to get as precise, or playful, with your lights as you wish. Use the louvre and flozier to perfect the amount and softness of light in your scene, while colour gels allow you to alter the colour of the light as it fills a room. Offset mounts and light stands allow you to position your lights any way you want, often getting them into places that may otherwise be unattainable without them. These lamps get to full-colour temperature in just three minutes. When you're finished with them simply turn off power with no need for a cool down period, so you can pack up and move out faster, and work more efficiently. Heat management is an important design element of the design of these fixtures. The physical heat of the lamp directly influences colour temperature, light output and lamp life. The lamps within these fixtures are correctly spaced to maximise light output and minimise heat. The reflector is vented in the back to increase airflow, while the ends are open to minimise heat build-up. And the power cord is oriented in such a way that the lamp tips will naturally be in a downward position when the fixture is operated vertically. The Heavy-Duty Flight Case is well suited for long-distance transport by sea or air, with its rugged construction that ensures the fixtures are well protected. The case has room for fixtures, spare lamps and stands, holding both of the Diva-Lite 201 fixtures included in the kit.